Jack at Fork and Bottle recently offered us a challenge: buy an artisanal or farmtead cheese and investigate food and beverage pairings with that cheese. Fork & Bottle will then take all the cheese and food pairings and create a master reference page with only the good pairing results. Spanish cheese? Although we have the accessibility of getting local cheese within a local meat shop – which occupy almost every corner in Spain right alongside banks, bars and pharmacies, I chose to take a little trip into Barcelona to find a quaint little cheese shop Ryan has come across in the past. Unfortunately, it was closed, but the good news is that Vila Viniteca, a gourmet food and wine shop located in the Born District of Barcelona, was open and happy to help me. Granted, helping me required a glass of Cava and an hour’s wait while Lora Zarubin, a food editor from House and Garden, tasted her way through several different tapas and wines, but I wasn’t in a hurry. I sort of enjoyed watching Lora direct both the employees of Vila Viniteca and her personal staff around like a general preparing for battle. I suppose after you’ve been in the publishing industry for as long as she has, you know exactly what you want in your article and the timeline you’re bound by. When all the hustle and bustle finally did die to my hearing only the soft electric buzz of the massive refrigerators behind me, I sat with Eva – one of the owners, bantering over cheese in Spain and what would considered the ideal artisanal cheeses. It’s an artisanal semi-hard cheese made only by Tony Chueca for his Cava, “La Bauma”, in a tiny pueblo called Bergedá nestled at foothills of the Pyrenees. This cheese defines artisenal, in that Tony is the only man who both founded his Cava and makes his cheeses – okay…sure, Toni and his goats. Hence, if this poor man comes down with a bad flu or throws his back from lifting wheels of cheese, there is no La Bauma cheese. How will you identify this cheese? 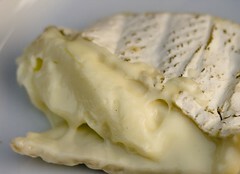 Other than looking at our fabulous picture, you will see its square elephant-gray, velvety rind right off the bat. It’s easy to find in a cluster of cheeses both because it is square and because of the gray volcanic ash seen through the brie-like rind. 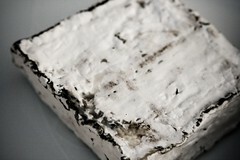 The interior has the same moist and cakey texture as other goat cheeses. The flavor is really delicate, buttery and mild with slight sweetness that leads to a an equally light acidity. This is also an artisanal cheese made by a husband and wife team from Extremadura (is the southwest bordering Portugal), who moved to Pais Vasco (on the north coast) to create their own cheese business. This is actually the same cheese we had at Restaurante Drolma the other evening, and which you can also find in some of the most exclusive restaurants and stores in Spain: El Bulli, The Ritz and El Corte Inglés. Although we were unfamiliar with this cheese prior to our dinner experience the other night, I can now understand its national fame. Round and wrapped in white plastic paper, it is 10 cm. in diameter and 3 cm. high weighing approximately 300 grams. The outside has a similar rind as a Camembert, but a texture more like a Torta del Casar – the national pride of Extremadura that has a very soft and creamy texture with a strong mature flavor. Its an incredibly creamy, luscious and delicious cheese (now, try to say that ten times quickly). Fork and Bottle requested that participants rate the cheese pairings on a 5 point scale, but as much as we had intended to follow his request, we found ourselves changing our ratings with several pairings over the duration of the tasting. Therefore, we felt it was easier to give the old thumb’s up or thumb’s down, giving us a general idea as to whether we liked or disliked the pairing. We apologize in advance if this causes a headache for you Jack. 2006 Ameztoi Getariako Txakolina, 90% Hondarribi Zuri and 10% Hondarribi Beltza – This wine was crisp and alive with flavors of light melon and peaches. Interestingly, this was one pairing we highly disagreed on. Ryan enjoyed the Txacoli with both cheeses – the racy acidity cut the fat leaving a nice fruit forward flavor; whereas I found the pairing to be poor – leaving a strange chalky flavor on the finish, especially with the La Bauma. 2006 El Perro Verde, 100% Verdejo – This was a thumb’s down for both of us. Both cheeses changed the flavor and of the wine, finishing with flabby and uninteresting flavors. Sidra: Fantastic with the La Bauma, bringing out the nice crisp apple flavor of the sidra, whereas the Ibar completely killed it. Thumbs up for the Bauma and down for the Ibar. La Bodega Tintarolba Higueruela Dulce, Garnacha Tintorera: Thumbs up on both counts. Being a nice sweet viscous dessert wine, it was a really nice pairing for both cheeses. Grilled ButifarraThumbs up for both of us. We felt the slightly spicy and salty flavors went beautifully with both cheeses. 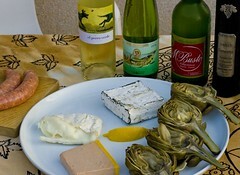 Grilled Artichokes with lemon and salt: Grilled artichokes call for fat, regardless if it is butter, oil or cheese. Big thumbs up. Although the La Bauma offered a fun acidic kick that the Ibar didn’t, we still felt they were both great. Arugula and Alfalfa Sprout Salad in an Oil and Vinaigrette Dressing: Again, thumbs up. Although alfalfa can sometimes be tough to pair with because of its perceived bitterness, both cheeses complimented it. However, if pushed into a corner, I suppose we’d lean more towards the Ibar only because it lacks the acidity of the La Bauma. Duck Pate Infused with Armagnac: Although Ryan doesn’t feel that pate should have been part of the pairing because as a generality, pate and cheese should not be paired; I felt it was an interesting addition. The richness of pate tends to overpower a cheese, while the fat cancels the fat, but I found the acidity of the La Bauma cut through the rich pate leaving a nice balanced flavor – boring heavy texture, but nice flavor. Nectarines: I did not like this at all with the cheeses, while Ryan enjoyed it. I like nectarines and never thought I would dislike it as much as I did, but jesus was this a poor pairing to me~! Peaches: Thumbs up! Really tasty with both cheeses. In short, we had a lot of fun doing this. We tend not to explore cheeses as much as we’d like to, nor do we contemplate their pairing capabilities while feasting on a variety of tapas. We had great time, and I’d love to do this again. Maybe next time we can do a Spanish olive oil tasting!